It's natural to have a lot of questions before stoma surgery. In this section, you can start getting some answers. You’ll find information about the different types of stomas, the kind of products you’ll be using, and other related topics. Contact your nearest stomaltherapist if you would like to convert your stoma appliances or to find a suitable appliance. When you have a stoma, urine and stools exit directly into the pouch on your abdomen. To avoid leaks, skin irritation or social embarrassment, it is very important that you learn how to seal the ostomy bag securely to the skin. Your stoma care nurse will help you choose the best product for you and show you how to apply and remove the pouch in the right way. In order to make you confident with the preparation, application, use and disposal of ostomy appliances, we made the below interactive Video. 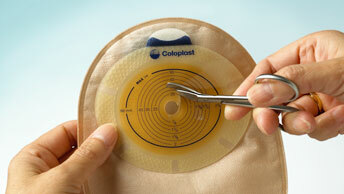 It takes you through the practical aspects of managing ostomy appliances. This includes tips to optimize performance of your appliance.